I have added myself as the 'artist' as David Bowie is not from Greater Manchester! This artwork shows my interpretation of David Bowie's work in the context of Manchester and so is relevant to the archive. I am 'artist' in the sense of visual artist, creator of the image. When I bought the Ziggy album in 1972 I was fascinated by the cover. I knew it was a street in London but in my head, I recreated it as if it had been photographed in a similar street in Manchester. In 2004 using Photoshop, I attempted to recreate the imaginary Manchester version of Heddon Street in London. The location is St James Square off John Dalton Street, and the right hand building is a former warehouse on Hilton Street, near China Lane. I used a lantern that was on a side street off Cross Street. 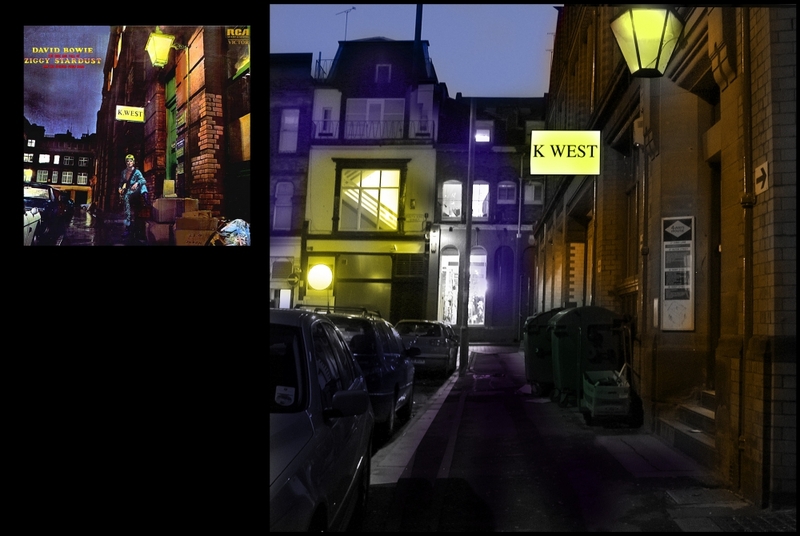 The K WEST sign was drawn in Photoshop, copied from the original. This image is an example of how we as Bowie fans adapt his reality to our own lives and locations, and so he and his world merge with ours as if part of our own lives. No other artist has had this effect. Bowie has few connections with Manchester so I had to create one and this is it! The only thing that's missing is David Bowie himself.